Every trip has a moment that truly stands out. 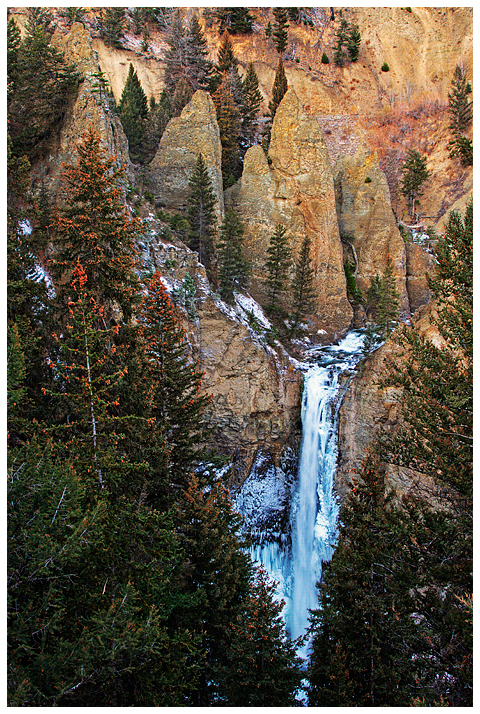 For me it was when my mom, brother and I went to visit Tower Falls in Yellowstone NP. After spending some time telling my mom and brother how amazing it would be, we decided to make the long drive up miles of twisting roads to reach the location. Not a single other person was around, we walked down the path to see the first view of the falls. The lookout was quite a way above Tower Falls, so we were looking at the mouth of it, but could not see the bottom (image below). A few months back, the lower trail to see the falls in its entirety collapsed and was closed. But as a wilderness photographer, a closed trail was not about to stop me. With bar-mace in hand, we ventured down the trail, once we reached the foot of the falls, we were all astounded. The water drops for more than 130 feet. The scene was breathtaking, rocks of all shapes and sizes covered the ground. I knew this was a once in a life time opportunity, so I took many photographs in several different compositions. For the image above, I wanted to highlight the interesting rocks, so I framed a large rounded rock in the bottom left corner. The rock creates a sense of weight , grounding the composition, the powerful water from Tower Falls reaches the end of its fall near the middle of the photograph, while the sun highlighted tops of the towering rock spires are placed at the top right of the composition to create a sense of balance. I hope you enjoy this interesting take on Tower Falls, I would really appreciate any type of comment, positive or negative. Above: Canon 7D, Canon 10-22mm lens, (@10mm), 6-stop neutral density filter, circular polarizer filter, ISO 100, F/16, 10 seconds. 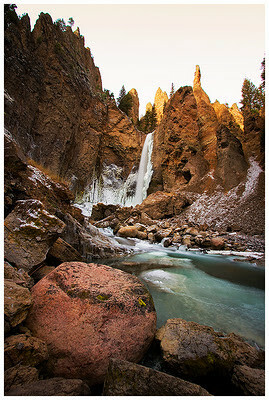 Below: Canon 7D, Canon 24-105mm L lens (@37mm), ISO 100, F/16, 3-shot HDR, middle exposure at 1/8th.